John Bartlett: Farm Talk - Get the Real Dirt! 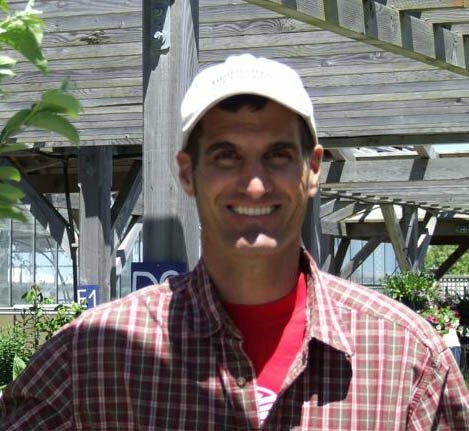 John Bartlett, CEO of Bartlett's Farm, will talk about the farm's organic and GAP certifications - what we are growing organically and why. He'll discuss the farm's use of Integrated Pest Management (IPM) to produce the highest quality vegetables with the least amount of chemicals. You'll also learn about the dirty dozen - 12 fruits and vegetables that you should choose to eat organically if possible. Plus, get behind the scenes information about what's new at the farm this year, and have a chance to ask John questions. FREE! If you missed Joann's talk on Juicing last weekend, you can get the recipe on our website. You can also talk to her about juicing fresh greens at our Spring Celebration on April 9. April is free repotting month. If your houseplants are looking sad, or if they need water every single day, they may need to be repotted. Spring is the perfect time to give them some fresh soil and room to grow. They may need a trim, too! Now is the time to bring them out to the farm, and we will repot them and spruce them up for free, when you purchase a new pot. 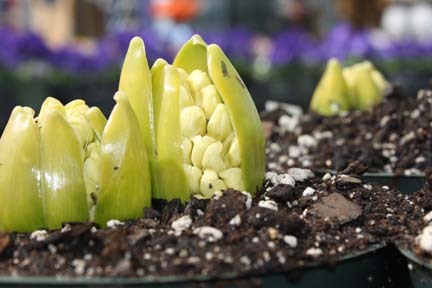 Hyacinths brave the cold to see if spring is really here! 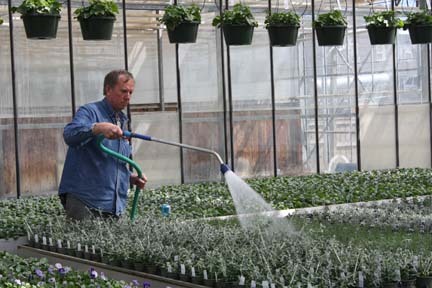 Pete can be found watering in one of the 20 ornamental greenhouses every day! 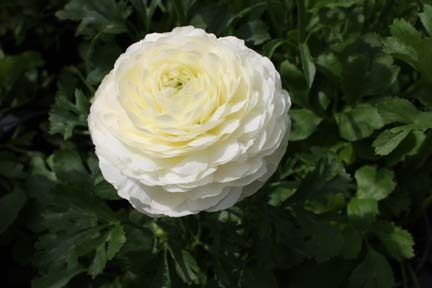 Hundreds of ranunculus are ready for spring window boxes. 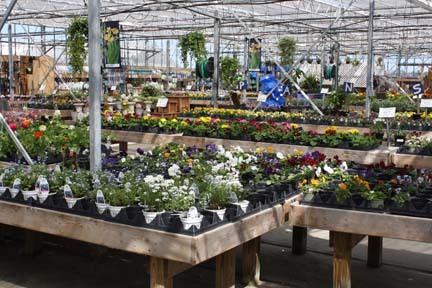 The garden center is brimming with farm-grown spring plants that we chose for their love of cool weather. That's especially helpful this spring. Pansies, primroses, early perennials, schizanthus and violas soak up the sunshine. 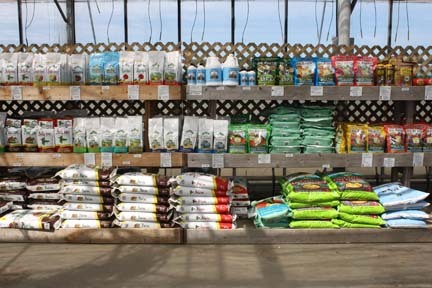 Liz has expanded the organic garden care products in the garden center. From fertilizer to insecticide or fungicide, there's an organic choice here. April First Friday Dinner-SOLD OUT! May's menu is coming soon...sign up early so you don't miss out! replant it when you purchase a new pot. We'll prepare hard boiled eggs and provide all the dyes and other goodies to decorate them (and we'll take care of the clean-up) from 10-11am. At 11:15 head out to the Garden Center for an Easter egg hunt. The Easter Bunny will even make a special appearance, so bring your camera! 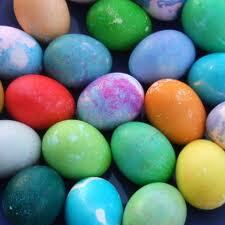 Registration and pre-payment ($5.00 for 1/2 dozen eggs) are required for the easter egg coloring activity. Register here or in person at the farm by April 21. April 21: Cooking Class with Tina Fournier. 6pm. "Keep it Simple" Make dinner in our kitchen with Tina, then enjoy it in the hayloft afterwards. Watch The Farm Dirt for more details next week.